Atlas Tube has donated 16 tons of steel hollow structural sections (HSS) to help rebuild L’École Lakay, a trade school located in Haiti that was severely damaged in the 2010 earthquake. 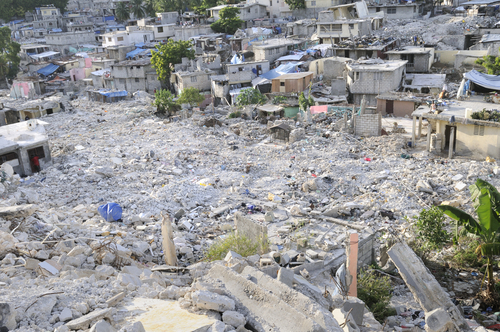 The town of Le Soleil, Haiti, was devastated by the earthquake, and L’École Lakay was left in an uninhabitable condition in its wake. A trade school run by the Salesiens of Don Basco, L’Ecole Lakay was forced to close due to the damage, but is now getting a second chance thanks to help provided by the Canadian Institute of Steel (CISC) and Atlas Tube. The CISC is part of an initiative that is raising funds and resources to rebuild the school tailored to the construction trades. As part of this effort, Atlas Tube has donated 16 tons of steel, including square tube (5×5 x .250) and round tube (4″ OD) that will be used to build columns for the school. Donating steel to help rebuild L’École Lakay is not only critical to the future students of Haiti, but to the future of the construction industry. Ensuring the ongoing education of Haiti’s skilled youth in construction trades will allow these graduates to help rebuild their country and help ensure that the future of the trades and construction industry is bright. The new, 2,100-square-meter L’École Lakay trade school will be primarily constructed from steel and will feature 16 classrooms, workshops, washrooms, offices, storage areas, covered walkways and a shaded outdoor space. Student enrollment increased dramatically since previous years and L’École Lakay expects to accommodate 200 students when it reopens. Atlas Tube will roll the materials in December 2012, and the steel will ship to L’École Lakay in early January 2013. For more information on the CISC’s initiative to raise funds for L’École Lakay in Haiti, please visit their website.